I was bowled over by this wonderful early birthday present I was sent. 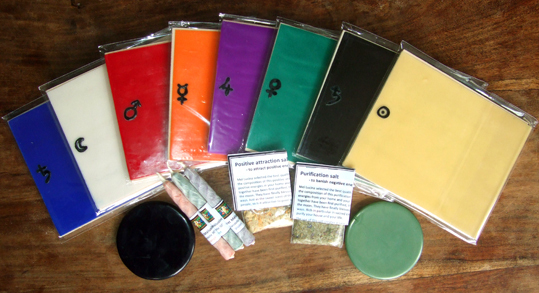 I was given a complete range of beeswax parchment spell candle kits and other goodies, all made by SecretMelusine. Each kit contains a flat sheet of coloured beeswax inscribed with the appropriate planetary symbol. A candle wick has been folded into one side of the sheet. What you do is inscribe your wish onto the wax using a pin or a marker pen, roll the sheet up to form a candle, then light it. As the smoke rises, your wish will be sent out into the universe. I'm a big fan of candle magic (I've written a book on the subject in the past) and this kind of candle spell is among my favourites. At workshops, I teach ways of using planetary correspondences to boost the power of spells. I also believe that the more you personally craft your magic, the better. These kits let you make your own candles in one of the most easy and effective ways. Beeswax is one of the materials used for its purity and magical properties in a lot of rites, in moulding statues, images, pentacles, lamens and even rings. Magical grimoires often mention seals of wax, as for example the Book of Abramelin the Mage and the Liber Juratus (Sigillum Dei Aementh), as well as books on planetary images such as the Liber de Angelis and the Munich Manual. The beeswax disks can be marked with words, symbols or sigils to create an amulet or talisman using the associations of colour.